GoughNuts Original Ring is our flagship chew toy first designed in 2006. There was a need for a safer product and there was a need for tougher or more durable product. The Original Ring design has no weak points. The GoughNut Original ring is tough, bounces, rolls, and floats (except for Pro 50 models). We have expanded the Green line to Black, our toughest color that utilizes engineered carbon reinforcement, and then to more visible colors of Orange and Yellow. Orange Green and Yellow all have the same strength while the Black and the Pro 50 are the toughest. 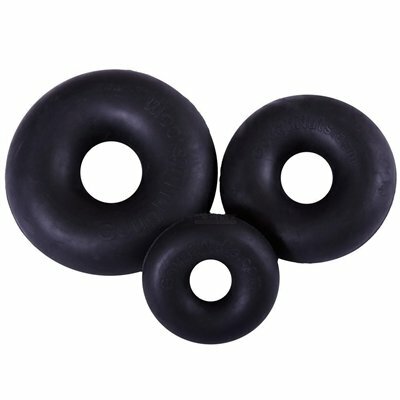 Pro 50 - This is High Modulus, 50 Hardness (10 points higher than our original GoughNuts Black recipe). This recipe is only for "The Power Chewing Dog." The Pro 50 toys are marked with a YELLOW dot. These models do not float. .75 Ring is offered in Green, Black, and Yellow - 3.75 inches in diameter and 1.3 inches cross section.